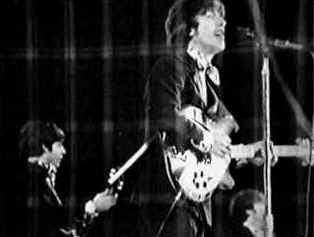 August 29th, 1966: It had been an exhausting madhouse for the Beatles 1966 Tour. On stage they couldn't hear themselves play, the technology of the day wasn't able to re-create the advancements they were making in the studio. As they were recording Revolver & the next project Sgt. Pepper on stage they were still doing basic songs like Rock & Roll Music. They wanted to focus their time on making music that would take rock & Roll to the next level. 1966 was a rough one for them, Lennon made his "more popular than Jesus comments" and the American South began Beatles boycotts, the KKK threatened then, & there were other death threats. They had just escaped the incident in Manila were the Marcos family turned the whole country against them, again they escaped with their lives in jeopardy. Besides all that, the Touring was getting to stressful. There were no days off, no privacy. Their plane would fly into a city and the mania began. 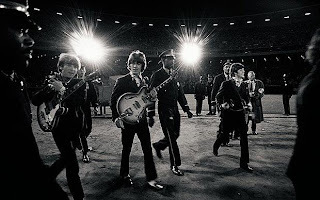 It was the sixties, riots, demonstrations, unrest and then the Beatles arrived in the middle of it all. They physically & mentally needed a break. They agreed this tour would be their last, maybe not for ever but for a long while. Paul was the last to agree but the decision was made. 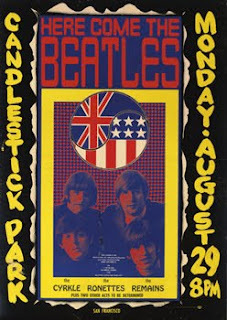 The last gig on the 1966 Tour was Candlestick Park, in San Francisco. The night before they gave their last press conference a s a touring act in Los Angeles. 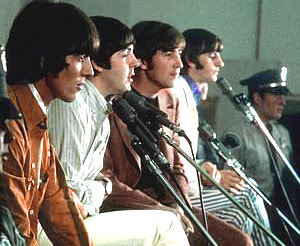 They did the press gig at the Capitol Records Building in Hollywood, with pal David Crosby by their side. 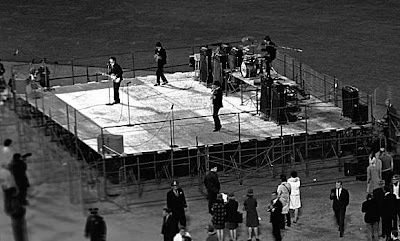 Then they went and played Dodger Stadium, a pretty new stadium at the time. They arrived in San Francisco to a bunch of stone faced police man and were shuffled onto the tour bus. When they arrived at the Stadium, the gates were locked. More madness. The crowds noticed them and chased the bus. The driver had to circle the parking lot and leave the grounds to avoid the fans. It was a scene right of A Hard Days Night, but it wasn't funny anymore. They arrived 20 minutes later into the open gates. 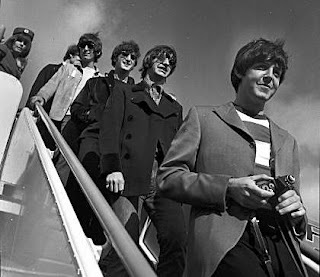 San Francisco treated the Beatles well. This was one of the safest places for them to end the tour. The music & art of Haight Ashbury was beginning to blossom into the pop culture world. Backstage was quiet, Brian Epstein knew it was the last gig and couldn't bring himself to attend. The Beatles ate dinner and entertained some friends & the press. Joan Baez & her sister visited the boys as well. The opening acts took the stage at 8 PM. The Remains, The Cyrkle (Red Rubber Ball) then the Ronettes (minus Ronnie Spector, Phil wouldn't allow her on the tour.) 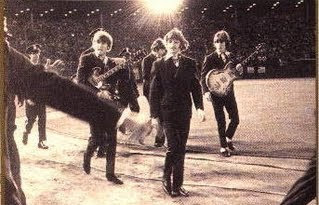 Next the Beatles walked out at 930 PM in flowered shirts and dark green suits carrying their own instruments. They waved opened the show with Rock & Roll Music. The driver of the armoured car was told to leave the engine on just in case a quick get away was needed. Twice guys tried to rush the stage , once during Baby's In Black & once during I Wanna Be Your Man. There was the occasional girl jumping on the field throughout the show. and they dashed off into the armoured car and drove off. The Crowd flashed its cameras & screamed. Off into the sunset the Beatles Concert days were over. They were relieved, the weight of the world off their shoulders. As George said "Its all over, I can stop pretending to be a Beatle now, people."